I can't believe that it is already October! October tells me that Fall is truly here. I put out my Halloween and Autumn decorations. I start craving soups and stews. My mind turns to all things pumpkin. Are you a pumpkin lover? 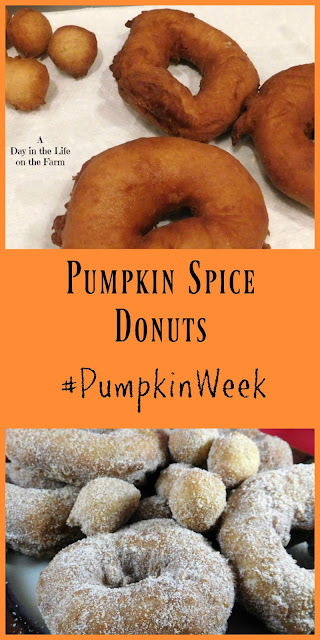 If you are then you are in luck because we are celebrating all things pumpkin all week long in a great event called Pumpkin Week. I look forward to pumpkin week each year. This is my 4th year participating in this event, hosted by Terri of Love and Confections. Putting on one of these week long events is a lot of work and I am very happy that she continues to do so each year. The first thing I do to prepare for pumpkin week is buy several pie pumpkins and roast them up so that I have plenty of pumpkin puree to use in my recipes. 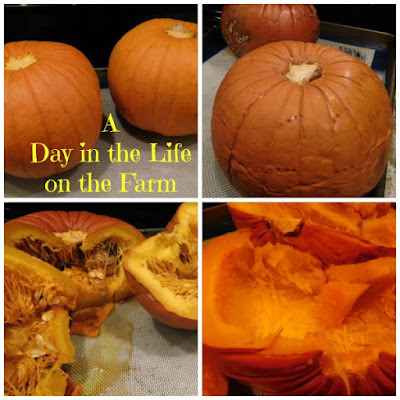 This is a super simple procedure and much less expensive than buying pumpkin puree from the store. Place your whole pumpkins onto a baking sheet lined with a silicone mat or parchment paper. Pierce the outer skin with a fork several places. Bake in a 400* oven for about an hour, until the pumpkin starts to cave in on itself and is very tender. Cut in half and remove all seeds and stringy pulp. Scrape the remaining pulp from the skins, place into a food processor and puree. Refrigerate for use within a few days or freeze for longer storage. 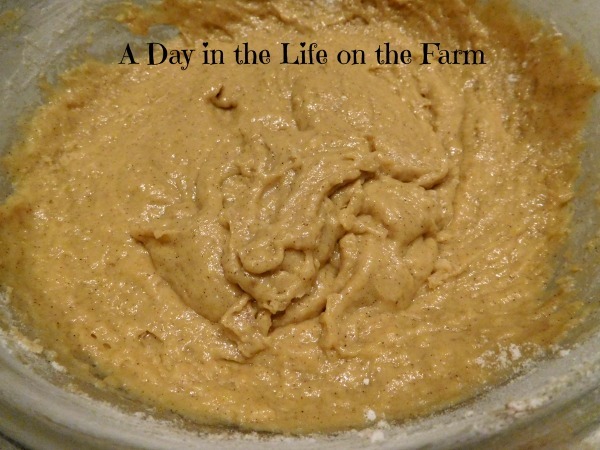 I'm very excited and proud of the recipes I am sharing this year. I am starting out with donuts because Autumn!!! Autumn=Cider Mills. Cider Mills=Donuts. 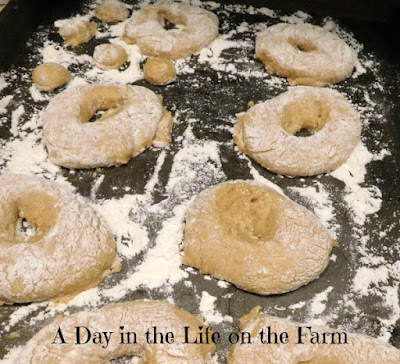 When my kids were young we would make donuts using refrigerated biscuit dough and enjoy them with cider while carving our pumpkins. It was a fun tradition and one that I wanted to resurrect now that I have a little one in my life again. But Grammy has evolved and so has her cooking and baking. So instead of doughnuts made from biscuit dough, the Little Miss and I made these homemade donuts that I am sharing with you today. Do you use donut or doughnut? I see that I have been using them interchangeably throughout this post. I wonder if that says something about me? I have to say that these donuts are not nearly as easy as those made from biscuits but they were a lot of fun and offered valuable "memory" time with my Angel Face. The dough is very wet. Even with the instructions to freeze for 15 minutes before rolling and cutting you are going to need LOTS of flour. 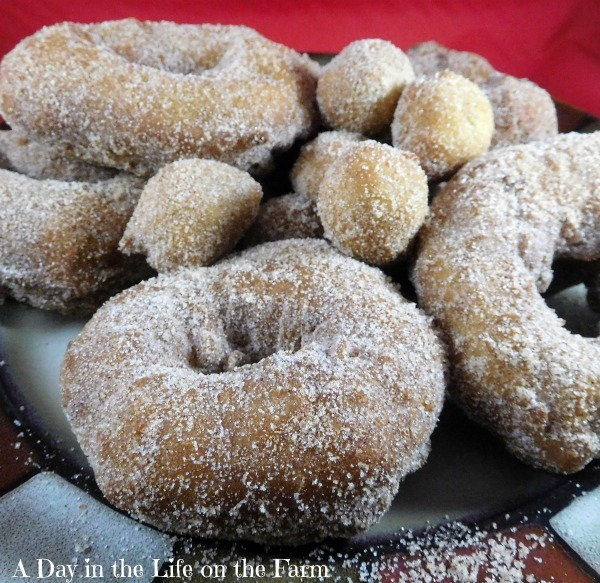 I think this recipe may be better suited for a donut press if you happen to have one. I don't. I used two different sizes of biscuit cutters. I got them into the oil and they fried up beautifully. I am so glad I didn't give up in frustration. Not only would we have missed out on these gorgeous, decadent donuts but my Little Miss would not have learned to keep plugging on even when things look hopeless. She and Grampy (my sous chef) shook them in cinnamon sugar while they were still hot for the finishing touch. 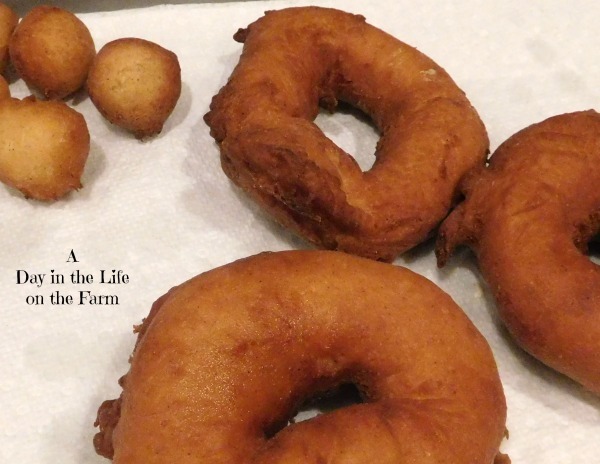 Nope, they were not as easy as the biscuit donuts but they sure were worth the extra effort! Make sure to stop by and see what the others are sharing on this first day of Pumpkin Week. Whisk together the egg and the yolk until frothy, in a large bowl. Add the pumpkin, both sugars, buttermilk and butter, whisking until combined. Stir in the baking powder, pumpkin spice and salt. 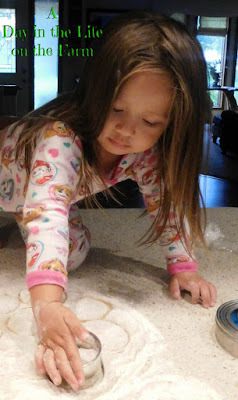 Gradually fold in the flour until a sticky dough forms. Cover the bowl and place in the freezer for 15 minutes. While dough is in freezer, heat 2" of oil in a dutch oven to a temperature of 370*. Using well floured hands turn the dough onto a well floured surface and pat to a thickness of 1/2" thick. Using a 3" and 1" round biscuit cutters, dipped in flour each time, cut out the dough, using the 1" cutter to make the holes in the center. Transfer the donuts and the dough from the holes onto a well floured baking sheet. 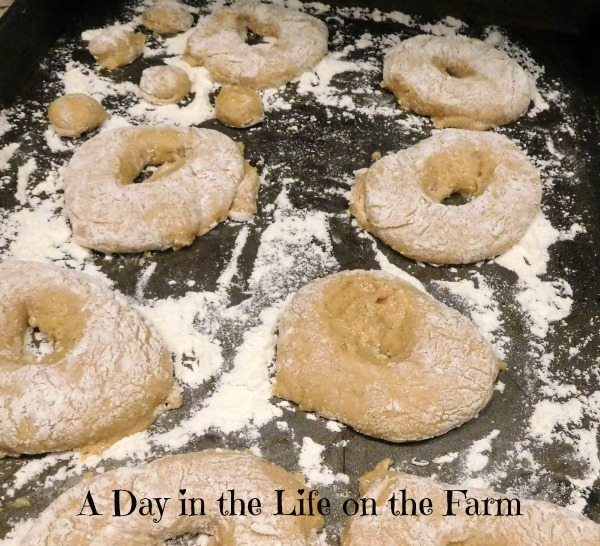 Flour a spatula (each time) and transfer the donuts and holes, in batches, to the hot oil. Cook until puffed and browned, about 3 minutes. Transfer to a paper towel lined baking sheet to drain. I so rarely fry things in my house mostly because I just don't like dealing with all the oil but these look like they'd be worth it. It is messy Erin, but there is nothing better, imho, than a fried cake donut. Yum! I am going to try these with some biscuit dough I have in the freezer. Sound really good! I hope you enjoy them Paula. Wendy those look wonderful and how big your beautiful little is getting! Fried donuts are a special treat - I haven't done that with my kids in forever. Lindsey might be old enough for a try. I use donut / doughnut interchangeably too!